, FE£ gIiH OIL COMPANY, LIMITED. wwf regjdtncvcai'fixjri-tial. _ persian otlf. n<Ttrp 7th November, 19 33.
m. We have the honour to refer to our letter No. 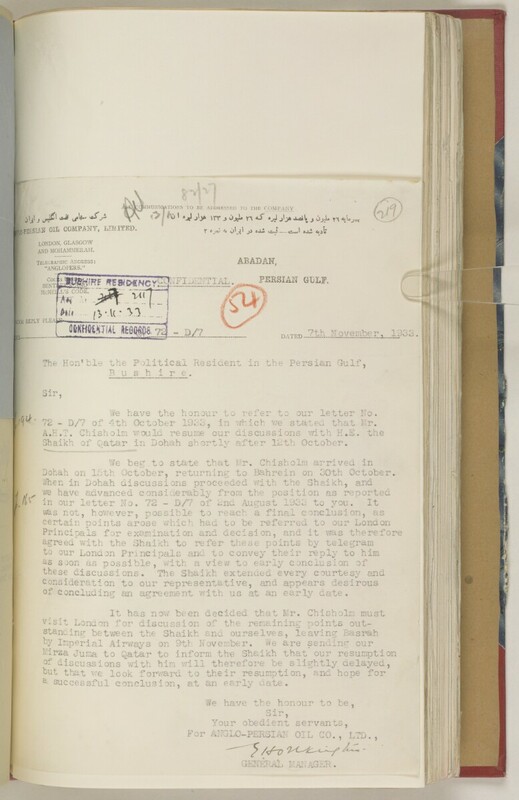 It * ' 72 - D/7 of 4th October 1933, in which we stated that Mr.
Shaikh of Qatar in Dohah shortly after 12th October. Dohah on 15th October, returning to Bahrein on 30th October. of concluding an agreement with us at an early date. a successful conclusion, at an early date. We have the honour to be.